3D printing with metals and other materials is giving new life to old machines and improving newer equipment’s performance. “Built like a tank” is a compliment when it comes to machines and equipment, and the typical food plant has enough “tanks” to equip the 1st Armored Division. Durability usually isn’t an issue with food machinery, but age and downtime can spell an end to its useful life. Studies suggest compounded costs of 18 to 25 percent per year are incurred when inventorying replacement parts. That’s a big disincentive for both OEMs and distributors to stock replacement parts and components, particularly for older machinery. As a consequence, food manufacturers can be forced to retire otherwise functional machinery because needed components are unavailable. The solution lies with 3D printing, believes Peer Munck, founder and CEO of 3Discovered, a Chicago start-up that bills itself as an “online exchange platform to facilitate the buying, selling and fabricating of commercial-grade, 3D printed parts.” Munck’s firm is stitching together a global network of 200 print shops that can execute 3D designs for needed components. Once considered exotic, 3D printing is on the brink of mainstream, with costs plummeting and material options expanding. Thermoplastics, stainless steel, titanium and more than 100 other materials can be used as the materials of construction. United Parcel Service plans on installing polymer 3D printers in 100 locations, and Munck’s firm hopes to include them in its fabrication network. “Think of it as 3D Kinkos,” he jokes. After root-cause analysis determined that a motor cover (left) resulted in motor failure, the part was re-engineered with metalized materials (right) and manufactured with a 3D printer. Photo: 3Discovered Inc. Almost a third of the output of industrial 3D printers is finished, functional parts, he estimates. In select cases, a part superior to the original can be fabricated at a fraction of the cost. 3Discovered’s mechanical engineers recently were asked to come up with an end cover for an electric motor mounted in a hydraulic robotic-arm assembly. The engineers determined that the original plastic cover became brittle over time from exposure to oil. A cover with identical dimensions was printed and electroplated to avoid a similar failure. 3Discovered’s first client was Advanced Technology Services Inc., a Peoria, Ill.-based firm that provides factory maintenance and IT services to 150 manufacturers. Both ATS and 3Discovered are targeting food and beverage companies. Aging machinery and in-house staffing shortages make food manufacturing fertile ground for maintenance, repair and operations (MRO) assistance. 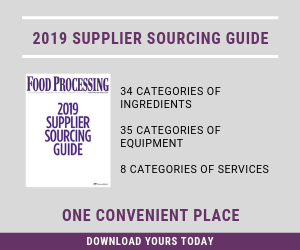 In Food Processing’s annual Manufacturing Outlook Survey, 21.5 percent of food professionals indicated some or all maintenance services are outsourced at their plants. Asset reliability is central to ATS’s services, and reliability begins with MRO crib management and extends to repairable parts management and tracking of all maintenance procedures. Failed part forensics is done each time a machine goes off line. “Our reliability process begins with gathering information about the root causes and then doing something about it,” according to Dave Gill, director-IPS (industrial parts services) for site operations. High-pressure washdowns often cause equipment failures in food plants. Rather than accept it as an unavoidable consequence of good sanitation, Gill’s colleagues determine if moisture is, indeed, the cause, then devise a solution. With electronics, heat may be the real issue. Fluorescent backlighting in HMI panels sometimes turns out to be the cause of failure, he says. Converting to LED backlighting has resolved the issue in some applications, says Gill. Managing the parts crib is challenging and expensive, but 3D printing offers manufacturers and OEMs an alternative means for keeping old machinery running longer. Photo: Meridium Inc. Cycle counts and other failure factors should be monitored by parts crib personnel, but “they don’t always have the time to focus on best practices,” he says. Supplementing in-house personnel with a specialist in MRO crib management can boost machine uptime and reduce replacement-parts costs. TPM is an excellent strategy for increasing machine uptime and making operators stakeholders in the maintenance process, suggests Greg Jacob, general manager of Allpax Products Inc., Covington, La. “Operators these days are being challenged to keep up with basic maintenance of retorts, including basic training of what the process-critical components are,” says Jacob, whose firm manufactures retorts, loaders, unloaders and other retort-room accessories. The Code of Federal Regulations (CFR) goes well beyond time and temperature in specifying how components that impact heat transfer rates must function. If the operator doesn’t have a sense of ownership, Jacob cautions, a plant can face unscheduled downtime and a hold on finished goods. Several process-critical parameters are covered by CFR, including operating temperature, pressure, flow rate of steam or hot water, agitation and the control chart. The onus is on plant personnel to document proper performance by the chart recorder, spray nozzles and other components or risk a ruling that they produced unprocessed product that must be held for up to 30 days. Whether it’s called a computerized maintenance management system or asset performance management software, computer systems give MRO personnel the ability to increase machine uptime and performance life. Photo: Meridium Inc.
With the Food Safety Modernization Act directing inspectors to be more scrupulous when reviewing validation tests and process deviations, Allpax developed Maintainer, a maintenance software package that functions like a CMMS for the retort room. “Plants want to minimize downtime, but manpower limitations force them to run to failure,” Jacobs points out. Maintainer prompts operators to perform validation tests and enter results in a database that organizes data in the CFR-specified format. Several enhancements have been made since Maintainer was introduced five years ago, the most significant being incorporation of a tablet that technicians can carry with them to respond to alarms by burrowing into SolidWorks views of parts in retort components. “As long as there is Wi-Fi in the plant, he can carry the tablet instead of a walkie-talkie and have access to information that reduces downtime,” says Jacobs. A tablet also is central in Operator Rounds, an asset management system from Meridium Inc., a Roanoke, Va., data collection and analysis firm. Sensors for condition monitoring remain more promise than reality in food manufacturing, notes Randy Scherer, director-implementation planning. Visual inspection is the foundation of uptime improvement, and Operator Rounds equips operators with handheld devices to capture information for analysis and action. Rounds is an element of Enterprise APM, Meridium’s shorthand for asset performance management. Most of the firm’s work has been in oil & gas and other heavy industries. Meridium now is targeting food & beverage, and Scherer cites some “big adult-beverage wins” to date. “We think it’s going to be a growth area for us,” he predicts. It may complement Maintainer, Jacob allows, but federal auditors expect retort room records to be in the specified CFR format. There are many nuances in food production, even when it comes to machine uptime and performance.